Say hello to Kimberly Einmo, the author of Jelly Roll Quilt Magic. She's a silly one, so make sure to stick around for the end! 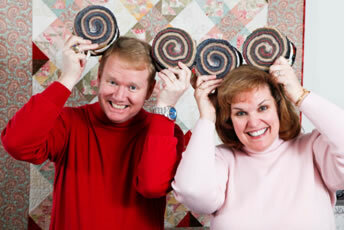 I’m simply delighted to be the guest blogger on the Jolly Jabber blog for the Fat Quarter Shop! I’ve been a long-time fan, follower, and customer as well. So I was over-the-moon thrilled when they asked me if I would be the guest blogger for the Jolly Jabber! I’m excited to introduce my newest book, Jelly Roll Quilt Magic, which was published and just released (hot off the presses!) by the American Quilter’s Society. This is my third book published by AQS and I couldn’t be happier. 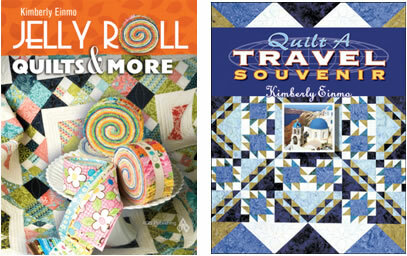 My first book, Quilt A Travel Souvenir, was released in 2005, and Jelly Roll Quilts & More, (the #1 best-selling book for AQS last year – I’m still blushing!) was released in 2010. 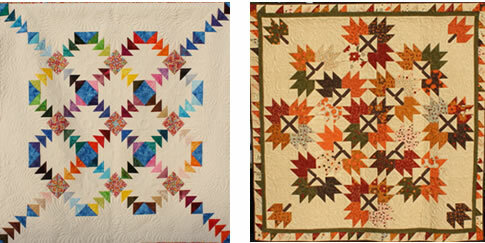 I had such a fantastic time putting the manuscript and quilts together for Jelly Roll Quilts & More that when it was released in 2010, I just couldn’t stop creating new designs, so I just kept going. I began to think of unique and different ways to use 2½” strips and units cut from charm packs and Layer Cakes. Before long, I had a whole bunch of new quilts so I put them together in a manuscript for Jelly Roll Quilt Magic and the rest as they say, is history. But what I really love about Jelly Rolls and precuts is this: they offer so much bang for your buck in terms of design potential and most of the prep work of cutting is done for you! Did you know that inch for inch, each Jelly Roll and Layer Cake contains 2½ yards of fabric? What’s not to love? 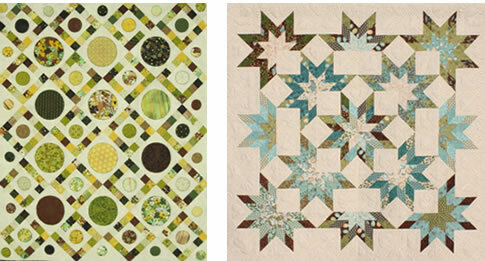 I’m excited to share some of the dynamic new quilts from Jelly Roll Quilt Magic with you. When someone tells me these quilts don’t look as though they were made from Jelly Rolls or precuts, I take it as a compliment! Here’s the whole crew: (from left to right) Joshua and Snickers, yours truly and Divot, Kent and Poppy, Andrew and Tuffy; formally known as Sir Hod. (The cat – not the kid….ahem.) Can you tell we love animals? • Both Kent and I used to work at Disney World (years ago!) although not at the same time, and we didn’t know each other then. • I love period movies – anything by Jane Austen, or romance films. • I’ve been in more than 38 countries and all but US 4 states; but unbelievably, I’ve never been to New York City. Luckily we’re about to change that with a trip to NYC planned in November! • I studied music for 14 years and was a church organist for many years. Now I just play the piano for fun and personal enjoyment. • I’ve lived where there have been a wide variety of critters besides typical birds and squirrels in our back yard including, deer, chipmunks, hedgehogs (my favorites!) and now, alligators, turtles and fish. I named our resident alligator Berlioz, but we absolutely do not feed him! Thank you for allowing me to be the guest blogger on the Jolly Jabber at the Fat Quarter Shop. It has truly been a privilege! I’d like to invite you all to stop by my newly redesigned website and check out all the exciting things there, including my blog.